Hey, guys! I hope you all had a very lovely week. Things are cooling down for us a bit in Texas, so it's definitely feeling like Fall is on the way! You know you've acclimated to Texas weather when anything under 70 degrees feels chilly. I've got some very special finds for you today. I've been so impressed with the products and shops since I began the KCL Friday Finds, and this week is no different. When something is handmade and beautifully packaged, you just know you're getting your money's worth. Add to that you're purchasing it from an individual or a small business, and it's something you can really feel good about. This first one is an essential as the weather begins to turn. And honestly, I think knits are going to be very big this season. We've seen a big surge in macrame and chunky knits in home decor, and that is going to translate to fashion as the weather gets colder. 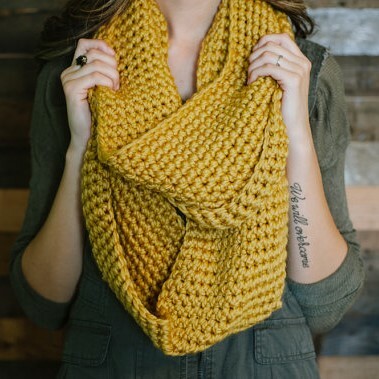 And what could be better for Fall than this gorgeous Chunky Knit Infinity Scarf in Mustard via Shanionie. 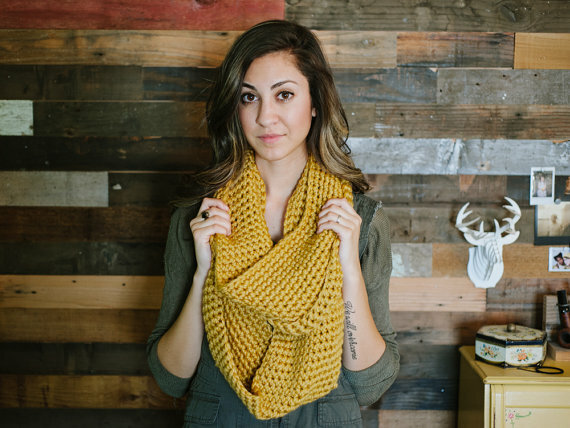 Shannon of Shanionie has several knit goodies; including more infinity scarves, hooded scarves, and knit boot cuffs. If you have a casual shift dress, all you need to take it into Fall is a pair of boots and one of these cute knit scarves! 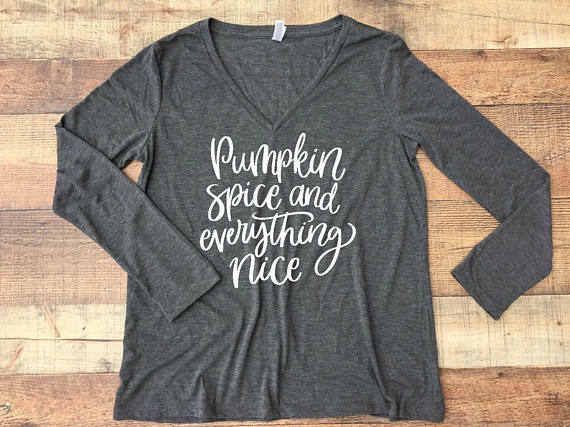 This Pumpkin Spice and Everything Nice Tee via The Southern Camellia is pretty much a staple for Fall as well. We've seen graphic tees explode on Instagram this year, bearing phrases out of the mouths of the most trendy lifestyle bloggers. Naturally this trend is continuing into Fall with anything having to do with pumpkins! At The Southern Camellia, you can get these fun sayings on tees as well as mugs, wine glasses, etc. It's a great place to shop for an Autumn hostess gift! Check out Jennifer's Fall Collection, and check back tomorrow, because I hear she is kicking off a giveaway! Bath and body products are such a fall thing to me as well, because I think of staying in and relaxing. And with the holidays coming up, I am also thinking about gifts. 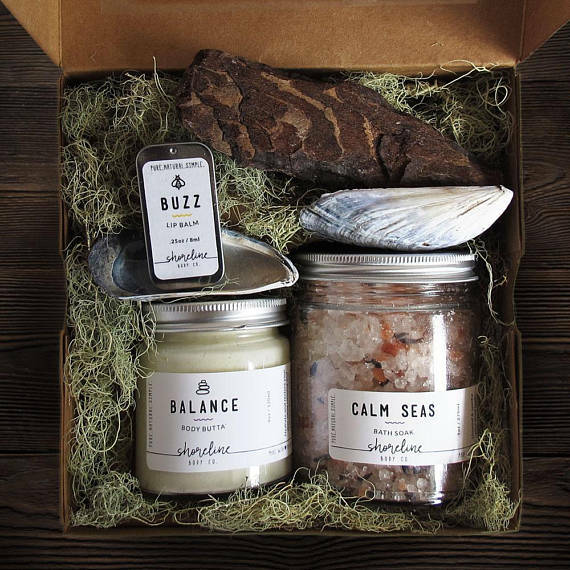 The "Balance Box" Spa Gift Set via Shoreline Body Co. is so beautifully packaged, it's perfect as a gift. Though I might want one for myself. The bath soak and body butter look so luxurious, and the Shoreline products are all-natural, free of toxins, and infused with beneficial herbs and botanicals. You can purchase individual items at Shoreline, though like I said, I want the pretty gift box! You can take a look at more of their handmade bath products at www.shorelinebody.com. Of course I also love anything with Autumn scents. 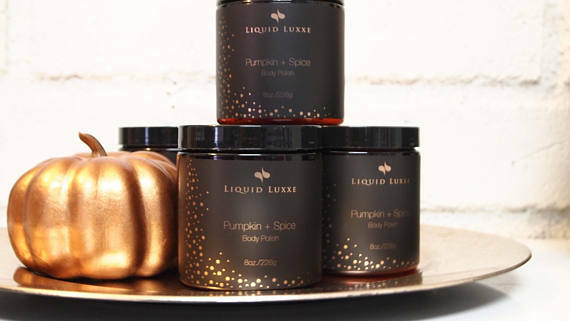 This Pumpkin + Spice Body Polish via Liquid Luxxe is perfect for the upcoming season. It's made with a blend of sweet sugary pumpkin and autumn spices like cinnamon and nutmeg. Those scents just make me feel so warm and cozy. I can imagine it would make for a very uplifting and relaxing shower. Liquid Luxxe has many other bath and body products, including some luxurious scented candles. If you shop during the month of September, you can take 10% off your order with the coupon code FALL10. Happy shopping! Of course I had to put more Autumn home decor into the mix. My husband and I are so ready to fill our home with pumpkins and leaves and all things fall. I am very happy to share this next darling shop with you guys. 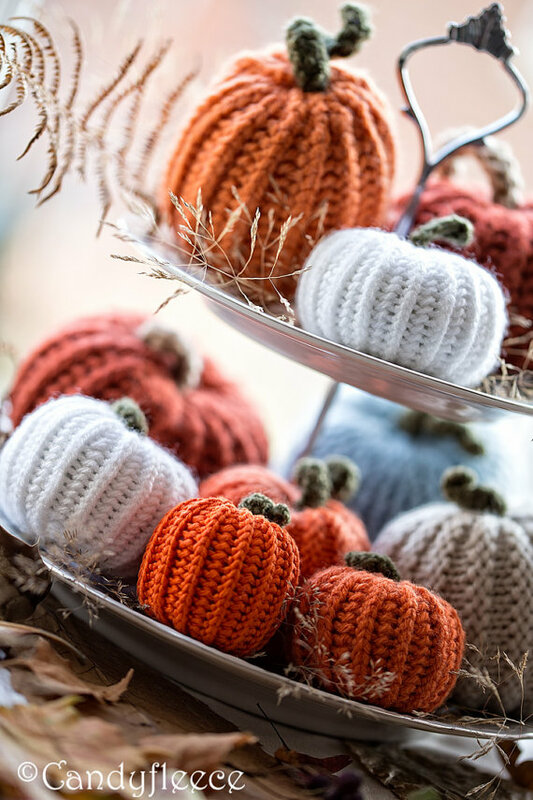 I am really loving knit pumpkins this year, so I just had to share this Set of 10 Knit Decorative Pumpkins via Candyfleece. I would display them exactly as they are in the product pic - arranged on a decorative tiered display. They would also look so beautiful on a fireplace mantle or arranged with candles for a festive centerpiece. And you guys absolutely must look at the rest of the items in Dina's shop! I mean it...click here >> and you'll find the most darling little handmade creatures. These are truly heirloom-worthy holiday pieces. If you're looking for a shop where you can get a unique high-quality gift for the holidays, this is the place! All orders are free shipping and you can save 20% off your order here >. And last but not least, be prepared to see a yummy candle in every Friday Finds post from now until after Christmas. There is nothing more comforting than a glowing candle on a cozy night in, especially if it smells like Fall! 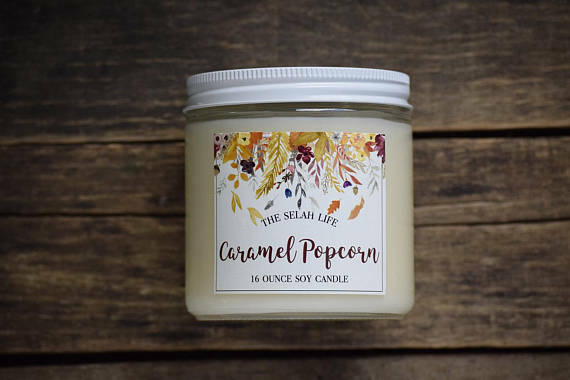 This Caramel Popcorn Soy Candle via The Selah Life is just one of many autumn-scented candles in Lisa's shop. I'm not sure how one would be able to pick between Caramelized Pralines, Brandied Pear, and Candied Apple! Which one would you try? So there you have it. Grab another cup of coffee, browse the shops, and enjoy all of the beautiful Autumn inspo. And have a great weekend! These are perfect for the fall season! You find the cutest stuff! Seriously loving all of this! Thanks, Rach! Glad you liked it! That knitted scarf is so lucious, Krisztina!! And those little pumpkins are the cutest ever!! I am a knitter, and so am drawn to those knitted pieces so much! Nice finds! I love the scarf and the color! Definitely! I love that mustard color for Fall! Great post, thanks for sharing :) I love these finds! Me too! They're so easy to style! I completely need that top. When I saw that Starbucks had PSL, I danced in front of the store! Love love love that scarf -- it looks so cozy! I can't believe fall is here! Chunky scarves season here we come! Amazing post! Love it! Great styling as always! Have a great week, Len! Loving your picks! I adore fall candles and your photos made me super inspired!